5 hotels with a sea view are waiting for you in Hendaye. 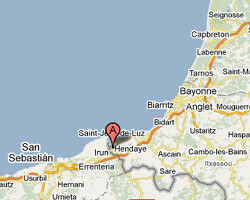 Hendaye is located on the border with Spain. At the seaside the sandy beach called "Grande Plage" is the longest of the Basque Country. Hendaye offers beaches without too many waves thanks to the protection of the Cape Figuier. There is a famous thalassotherapy center. The rocky coastline is dominated by the Pyrenees. The climate is mild most of the year. 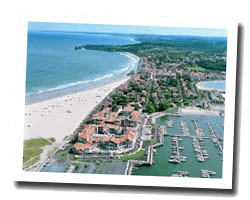 In Hendaye enjoy the pleasure of a sea view hotel.